Probably no other American has done more to endear people to the Catholic faith than the beloved Archbishop Fulton J. Sheen. Beginning in 1930 and for 22 years thereafter, his radio show, "The Catholic Hour," reached millions of Catholics and non-Catholics alike. Then from 1951 to 1957, his groundbreaking television program, "Life is Worth Living," reached an estimated 30 million viewers each week. 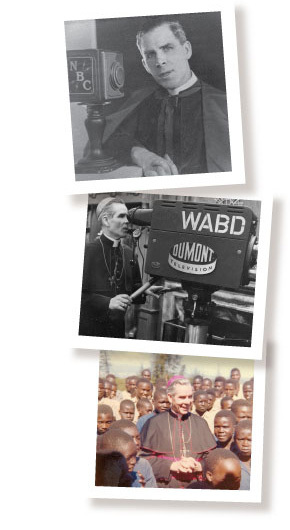 Archbishop Sheen touched so many lives that he would receive as many as 25,000 letters a day. When you consider that he wrote 66 books, 62 booklets and thousands of letters, served as editor of two magazines for 16 years, and was a syndicated columnist in the secular press for 30 years, there is a reason why the Jesuit magazine "America" once called him "the greatest evangelizer in the history of the Catholic Church of the United States." His impact as National Director for the Propagation of the Faith was equally important to the Church. For 16 years, he led this effort for 129 dioceses throughout the United States and influenced the lives of tens of millions of people all over the world. Even today, nearly 30 years after his death, he is still quoted widely. His books are still read and his original broadcasts are viewed by millions in over 177 countries on the Eternal World Television Network. In 2002, the Congregation for the Causes of the Saints officially opened the Cause for Archbishop Sheen's Canonization and conferred on him the title Servant of God.